The Holy Innocents Church, Highnam, is a Grade I Listed Building, one of the most significant Victorian churches in the country. It is situated with the other community buildings on the outskirts of the village. 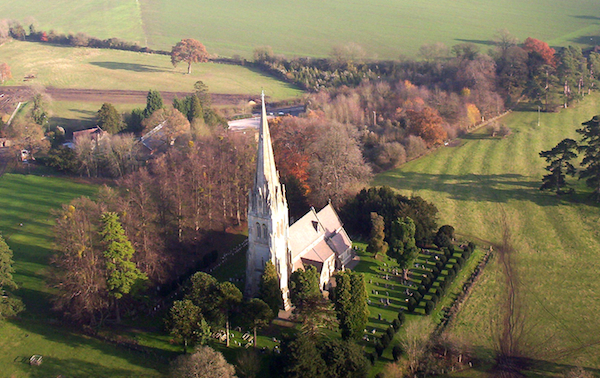 The church was commissioned by Thomas Gambier Parry the owner of the nearby Highnam Court, and was consecrated in 1851. The architecture is gothic revival style, and the church is decorated throughout with frescos painted by Thomas Gambier Parry. Hubert Parry, his son, inherited the estate and is best remembered for his musical setting for Blake’s poem ‘Jerusalem’ and much other memorable church music. The church continues as the parish church of the Highnam community of over 2000 people. We worship regularly on Sundays as well as during the week, and are engaged in pastoral care and activities throughout the village. Highnam is part of the Benefice that includes Tibberton, Taynton and Rudford. If you are a local resident, or from further afield, you will be most welcome. You can visit our Facebook page by clicking here.